Invincible is a typical modern French pear, with a sweet and juicy flesh, and a hint of violet. Despite its delicate flavour, Invincible is one of the hardiest pear varieties, good for difficult situations which other pears would not tolerate. The fruit can be kept for a few months in store. Invincible® is a protected variety. Please fill in the details below and we will let you know when Invincible pear trees are back in stock. Invincible is in flowering group 2. Invincible is partially self-fertile, but fruiting will be improved if there is a compatible tree of a different variety nearby. Pears tend to come into blossom quite early in the spring, putting the blossom at risk from late frosts. If this happens Invincible, unusually, will often produce a second set of blossom. Invincible also comes into bearing at a younger age than most other pear varieties, so you won't have as long to wait for the fruit to arrive. 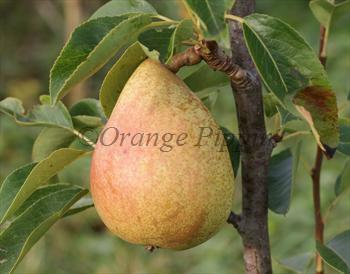 Despite its hardy resilience, as with all pears it is best planted in full sun to achieve the best flavours. Invincible is one of a small number of pear varieties that are not fully compatible with some Quince rootstocks, which are widely used for controlling the height of pear trees. Therefore we sometimes use an "inter-stem" of a different but compatible pear variety, so you may two graft unions at the base of the stem. Invincible was introduced by the Delbard nursery, France. It is sometimes known as Fertilia.